Luxembourg, located in western Europe, southeast of Belgium and between France and Germany, is a worthwhile country to visit on a vacation. Packed into 2,586 square kilometers are many impressive medieval castles (notably the ones at Vianden and Clervaux), beautiful scenery, the Moselle wine region, and historical artifacts dating back to the Roman occupation. The most popular destination is the spectacular fortress City of Luxembourg itself. The view above shows Luxembourg City around 1858, before the dismantling of major portions of the fortress in accordance with the Treaty of London of 1867 and before the building of the railroad viaduct that now sweeps around the town. Very few ruins remain of the ancient castle built around 963 A.D. on the rocky outcrop on the right side of the drawing. Grand Duke Henri The Grand Duchy of Luxembourg was formed in 1815 by agreement of the European powers at the Congress of Vienna. It was originally ruled by the King of The Netherlands, but in 1890 official ties were severed when the King died with no male heir. The Grand Duchy has had its own monarch ever since. 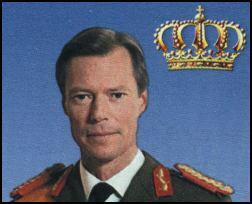 The current sovereign is Grand Duke Henri of the House of Nassau-Weilburg. Henri was born in 1955 and assumed power on October 7, 2000 when his father, Grand Duke Jean, abdicated in his favor. Henri married Maria Teresa Mestre on February 14, 1981. The royal couple have five children: Crown Prince Guillaume (1981), Félix (1984), Louis (1986), Alexandra (1991), and Sébastien (1992). Luxembourg is divided into 3 districts and 12 legislative areas called cantons. The climate of Luxembourg is best described as moderate — the average July temperature is 17.5 Celsius (63.5 Fahrenheit) and the average for January is 0.8 Celsius (33.4 Fahrenheit). Average annual rainfall is 782 mm (30.8 inches). Cities in North America with similar (though wetter) weather are Vancouver, British Columbia and Seattle, Washington. Look here for current Luxembourg weather conditions (courtesy of the Weather Channel). The unit of currency in Luxembourg — since January 1, 2002 — is the Euro. (It replaces the old Luxembourg franc at an exchange rate of 40.3399 per euro.) The euro was worth approximately $USA 1.287 ($USA 1.00 = EUR 0.7767) as of March 26, 2013. A convenient way to get to Luxembourg by air from North America is to fly to London, then take a Luxair flight to Findel Airport in Luxembourg City. There are also connections to Luxembourg from most other major western European airports. Unfortunately, there are no longer any non-stop or direct flights between North America and Luxembourg. Train and Bus. The most economical way to get around in Luxembourg is by train (CFL) and bus. Luxembourg has a transit network of more than 870 miles that services almost all major towns. You can purchase a ticket, called an Dagesbilljee, for EUR 4 that is good for an unlimited number of trips from the time the ticket is first used until 4 a.m. the next morning. Individual bus tickets (Kuerzstreckebilljee tickets), good for two hours, are EUR 2.00 each. Car. Car rental rates in Luxembourg have been amongst the lowest in Europe for some time. This year is no exception, although rates in neighboring Belgium and Germany are now usually a bit lower. Luxembourg has the lowest gasoline prices in Europe, significantly less than in neighboring Belgium, Germany, and France, so be sure to fill up on the right side of the border. 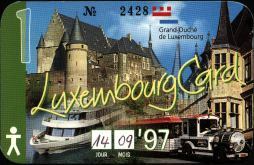 A very economical way to travel Luxembourg and see its major attractions is to buy the Luxembourg Card. The Luxembourg Card, available from Easter to December 31 each year, provides free access to the national public transportation network, free admission to 40 attractions, and discounts at four other attractions. Family or individual cards are available for a period of either one, two, or three days. The price is very reasonable — the one-day individual card costs EUR 13, for example. There are plenty of good places to stay in Luxembourg, ranging from simple rooms with a bath down the hall to five-star hotels. The Luxembourg tourist offices (see below) have useful publications to help you find accommodation. Local tourist offices also exist in Beaufort, Berdorf, Bettendorf, Bourscheid, Clervaux, Diekirch, Differdange, Dudelange, Echternach, Esch-sur-Alzette, Esch-sur-Sûre, Ettelbrück, Grevenmacher, Grosbous, Hosingen, Kaundorf, Kayl, Larochette, Mersch, Mondorf-les-Bains, Munshausen, Pétange, Reisdorf, Remich, Vianden, Weiswampach, and Wiltz. If you really, really like Luxembourg, you may want to live and work there. To look for a job in Luxembourg, start by visiting the Monster, Jobs.lu, JobFinder, and Optioncarriere web sites. This site was launched on November 8, 1995.